The Icom IC-F5121D | IC-F6121D is a great entry level digital base station. Less complicated to operate than most digital radios, still with generous features. The IC-F5121DB | IC-F6121DB provides an easy transition path to digital due to it's mixed mode digital & analog operation. It can receive both analog and digital signals on a single channel, automatically selecting the transmit mode to reply to a call, so users can just start talking. The HM-152 is supplied as a standard microphone, you can select from 5 levels of microphone gain for clearer transmission. There are several optional hand microphones such as a DTMF (HM-152T), a heavy duty (HM-148G), or a heavy duty with DTMF (HM-148T). Even though it's an 'entry level' digital base station, it's still has numerous features. 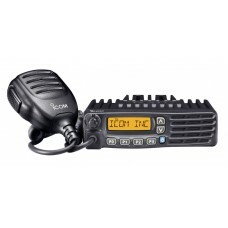 The built-in MDC1200 signaling includes PTT ID (ANI), Radio Check (RX), Emergency, Stn/Kill (RX), and a 500 alias table. The IC-F5121DB | IC-F6121DB series can decode up to ten 2-Tone codes and eight 5-Tone codes on a channel. The following actions are programmable to respond to each tone. • Beep sound • Stun/Kill/Revive • Auto TX • Bell icon • Scanning • Answer back call • External output (to a device such as a horn when connected). The radio has 8 DTMF autodial memories. The IC-F5121D | IC-F6121D also has a built-in Emergency Call function allowing you to send a repeat emergency message to dispatch until dispatch responds to it. When in Emergency mode, the radio can transmit anything the microphone hears and the dispatcher can monitor the surrounding sound. Lone worker function engages if there is no operation during a pre-defined period of time. When activated, the transceiver is put into the emergency mode and the radio places an emergency call to alert your co-workers or dispatcher. If secure communication is an issue, digital signals are difficult to decode by current scanner receivers due to modulation/demodulation. The when used in an IDAS™ system, the IC-F5121D | IC-F6121D base station supports the digital voice scrambler function for added security.